Leiomyoma is the most common tumor of the genital tract. Uterine leiomyoma is classified into two major categories – conventional leiomyoma which are symmetrically expansible, rounded, and circumscribed and uterine smooth muscle tumors with unusual growth patterns. Due to its striking resemblance to cotyledons of placenta and its dissecting nature, it is named as cotyledonoid dissecting leiomyoma (CDL). It was previously also known as Sternberg tumor or grape-like leiomyoma., It is important to recognize this tumor since it may be confused with a malignant neoplasm because of its bizarre macroscopic appearance, but it has a benign histology and biological behavior. To date, only 41 cases of CDLs have been reported in literature. Here, we emphasize that clinicians should be aware of this rare entity to prevent unnecessary aggressive treatment due to its warning gross morphology. 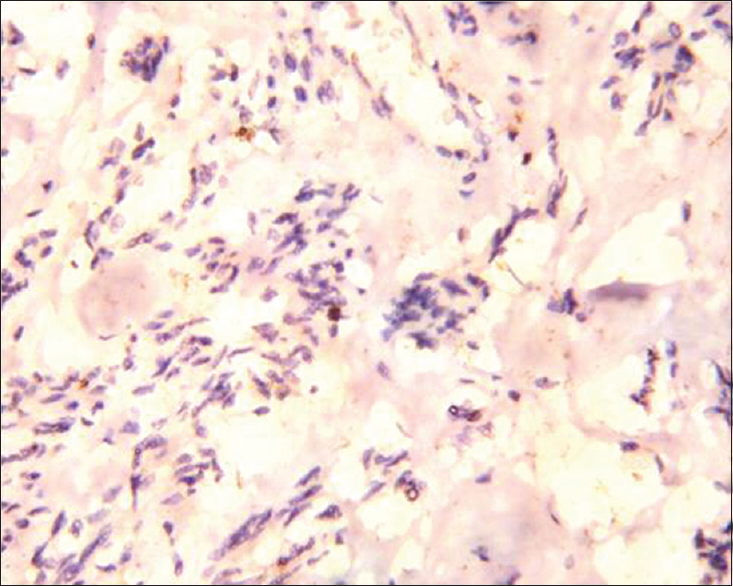 We report a rare case of CDL in a 50-year-old female. She was para 2, living 2 (P2L2) with previous lower segment cesarean section. She presented with heavy menstrual bleeding and congestive dysmenorrhea for the past 4 months. On abdominal examination, no mass was palpable; on pelvic examination, uterus felt bulky, a large irregular mass felt in pouch of Douglas pushing the uterus anteriorly. Ultrasonography showed uterus bulky, 11.5 cm × 3.6 cm in size. Left lateral wall of uterus showed evidence of a heterogeneous mass of 7 cm × 4 cm. Mass showed increased vascularity. Margins of mass not well defined. Endometrial thickness was 5mm. Right ovary showed evidence of a retention cyst 3.3 cm. Left ovary enlarged measures 10.6 cm × 4.9 cm. Left ovary adherent to left side of uterus showed a cyst of 3.1 cm with fine internal echoes (? endometriotic cyst). Magnetic resonance imaging pelvis showed uterus of 10.8 cm × 4.4 cm size. Endometrial cavity was normal. Junctional zone was normal. Well-defined space-occupying lesion appearing hypointense on T2W images seen in the right lateral wall of uterus in intramural location measuring approximately 2.8 cm × 2.4 cm. Similar smaller space-occupying lesion was seen in posterior myometrium measuring approximately 1.4 cm × 1.3 cm. Right ovary showed two simple unilocular cysts measuring 2.6 cm × 2.5 cm and 3.1 cm × 2.1 cm. A large cystic space-occupying lesion was seen in pelvis situated in pouch of Douglas measuring 7 cm × 4 cm with peripherally arranged hemorrhagic cyst largest measuring 3.3 cm × 2.7 cm likely to be left ovarian origin leading to ovarian enlargement. Uterus displaced anteriorly by the lesion. No enlarged lymph nodes or ascites were present. Tumor markers were CA-125-67U/ml and HE4-55 pmol/L. Other relevant laboratory investigations were within normal range. The patient was taken up for diagnostic laparoscopy to look for the nature of mass (benign/malignant). On laparoscopy, uterus was of normal size, pushed anteriorly by a big mass in the POD which was variegated, congested, and with irregular margins. Both ovaries and tubes were almost normal. Origin of mass could not be made out. The appearance of the mass was felt to be malignant, so plan for laparotomy followed by total abdominal hysterectomy with bilateral salpingo-oophorectomy was made. Laparotomy findings were uterus normal size. Bilateral tubes and ovaries were normal. A 10 cm × 10 cm exophytic, fleshy, serosal, polypoidal mass originating from posterolateral wall of uterus giving an impression of malignancy was noted. Cut section of uterus was normal. Macroscopically, the entire specimen including tumor, uterus, and adnexa weighed 450 g. The serosal surface showed an irregularly contoured exophytic mass measuring 11.8 cm × 10.5 cm × 5.5 cm, arising from the lower left lateral posterior uterine wall. The mass was bosselated, partly cystic and large part of the mass had poorly defined borders with the myometrium in the lower uterine wall. Cut surface demonstrated firm nodules of grayish white tissue and multiple thin-walled cysts. The myometrium showed trabeculations and focal cystic areas. 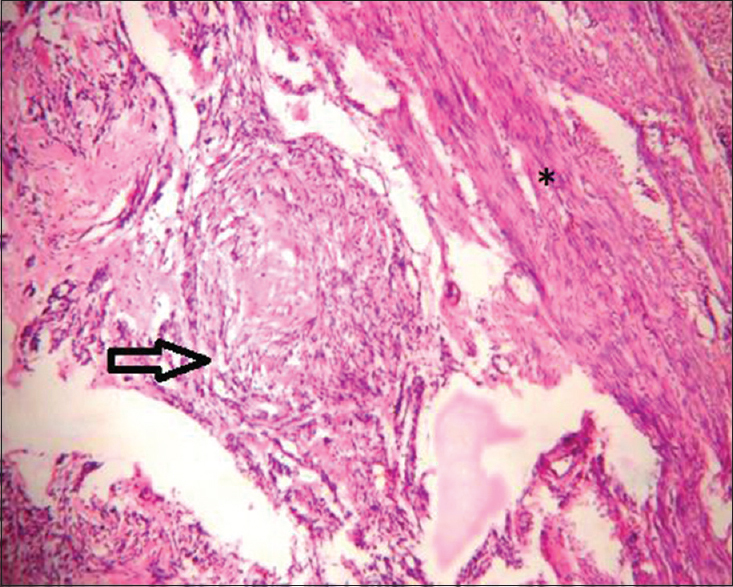 Histopathologically, tumor had two components – a cotyledonoid extrauterine component and an intramural component and the former was intramural in origin. The lesion consisted of a proliferation of smooth muscle cells with intra- and extrauterine tumor component with hyalinization. The tumor was composed of interlacing fascicles, whorls, and bundles of bland smooth muscle cells. No increase in cellularity, mitosis, or atypia was seen. Areas of perinodular hydropic degeneration were also evident. Myometrial component showed tumor nodules with a dissecting pattern within adjacent uterine smooth muscle layer. Immunohistochemistry showed smooth muscle actin, h-caldesmon: positive in tumor cells (tumor of smooth muscle) Ki-67 Proliferating index: low (2%), CD34: negative in tumor cells, highlights the blood vessels (intravascular component was excluded), and CD10: negative in tumor cells. A diagnosis of CDL was made according to the macroscopic, microscopic, and immunophenotype appearance of the tumor [Figure 1], [Figure 2], [Figure 3], [Figure 4]. CDL or Sternberg tumor was first described in 1996 by Roth et al. It can be presented in a wide age range between 23 and 65 years of age (mean 40.3 years). The most common presenting symptoms are abnormal uterine bleeding and pelvic mass, just as our current case. The impression of malignancy can be attributed to the rarity and bizarre appearance of the tumor.,, CDL on microscopy shows characteristic perinodular hydropic degeneration, so it has to be differentiated from leiomyoma showing this change. The exophytic bulbous smooth muscle component, grossly resembling placental tissue protrudes from the uterine surface. The exophytic mass is usually in continuity with an intramural component dissecting the surrounding myometrium. Intraoperative impression can be of a malignant neoplasm, especially leiomyosarcoma due to infiltrative growth pattern and softer consistency. On microscopy, there is no atypia or increase in mitosis and tumor has low Ki-67 proliferative index. Grossly as they resemble malignant tumors and differential diagnosis might be problematic, both gynecologic surgeons and pathologists should be well aware of these leiomyoma variants. Cotyledonoid leiomyoma has a distinctive gross appearance which usually raises the suspicion of sarcoma. Intraoperative frozen section is a helpful procedure to avoid overtreatment of such cases. CDL is very rare benign uterine tumor. Intraoperatively, the worrisome appearance of gross specimen is often mistaken for malignancy leading to overtreatment. If awareness of this entity is there unnecessary surgical procedure (TAH+BSO) can be avoided in reproductive age group. The authors would like to thank Dr. Prateek Ladha for helping in preparing the case report. 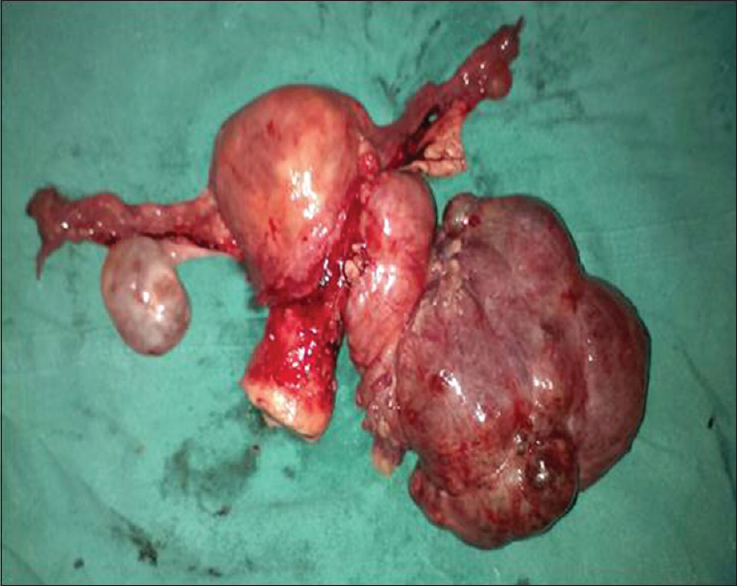 Ersöz S, Turgutalp H, Mungan S, Güvendı G, Güven S. Cotyledonoid leiomyoma of uterus: A case report. Turk Patoloji Derg 2011;27:257-60. El-Agwany AS. Sternberg tumour of the uterus (Cotyledonoid uterine leiomyoma): A rare benign uterine smooth muscle tumour with suspicious appearance. Surg J 2013;8:4-5. Smith CC, Gold MA, Wile G, Fadare O. Cotyledonoid dissecting leiomyoma of the uterus: A review of clinical, pathological, and radiological features. Int J Surg Pathol 2012;20:330-41. Roth LM, Reed RJ, Sternberg WH. Cotyledonoid dissecting leiomyoma of the uterus. The sternberg tumor. Am J Surg Pathol 1996;20:1455-61. Saeed AS, Hanaa B, Faisal AS, Najla AM. 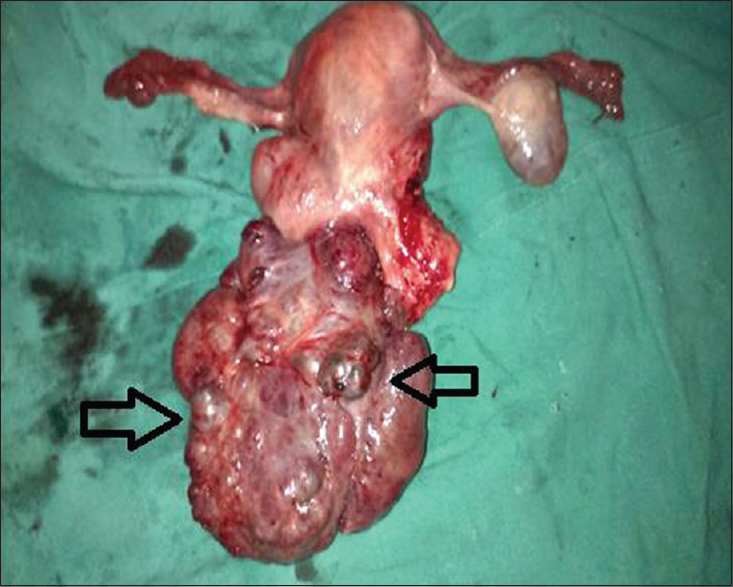 Cotyledonoid dissecting leiomyoma of the uterus: A case report of a benign uterine tumor with sarcomalike gross appearance and review of literature. Int J Gynecol Pathol 2006;25:262-7.